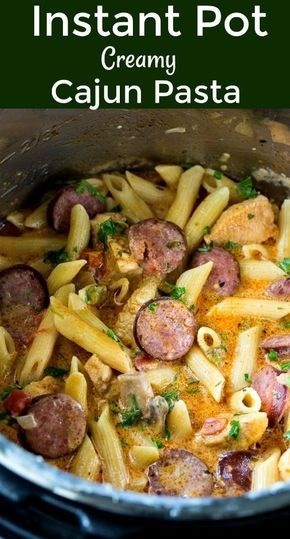 Instant Pot Creamy Cajun Pasta with chicken and smoked sausage in a creamy, spicy sauce makes an easy and flavorful family meal. It can be made start to finish in under 30 minutes. Turn Instant Pot on "Saute" mode. Add oil and butter. Add onion and green pepper and cook until starting to get soft, about 2 to 3 minutes. Add sausage and garlic and cook another 2 to 3 minutes.